The 2012 Extreme Sailing Series is set to descend on Nice, France, over 18-21 October. Four days of racing are planned in the final European event of the 2012 series where eight Extreme 40 teams are competing, including current series leader and skipper of The Wave, Muscat, Leigh McMillan. Three victories this year may see McMillan top of the leaderboard, but just seven points behind are two teams tied on points – their Omani team mates, Oman Air, fresh from a win in Cardiff, Wales, and the Austrian team on Red Bull Sailing Team. Williams is currently leading the second half of the fleet, where the battle is just as close. 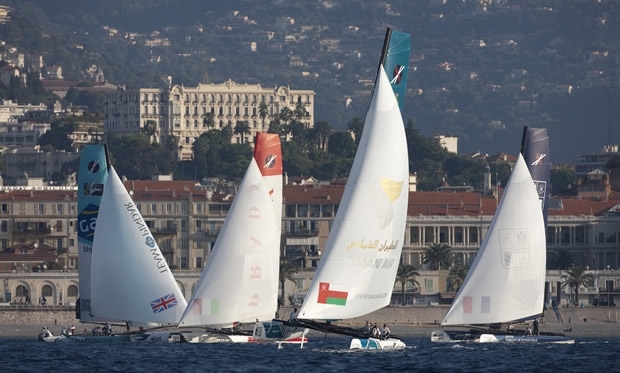 Only 10 points separate fourth placed GAC Pindar from eighth placed ZouLou which will be named Extreme Ville de Nice as the local team for the French event, as they head into the Nice event, with the Danish SAP Extreme Sailing Team and the Swiss Alinghi sandwiched between them. Taking to the water with the Jaguar NeilPryde Racing Series, the main warm-up act on the water, will be current RS:X World Champion and Olympic silver medallist Julien Bontemps. Spectators can watch 50 of France and Europe’s finest windsurfers on the Extreme 40 racecourse each morning before racing ensuring the action on the water never stops.